Cut up fruit into small chunks and place at bottom of jar or pitcher. Use a wooden spoon to smoosh fruit and release some of the juices. If using herbs gently bruise the leaves, do not pulverize to pieces. Add the ice on top and fill the remainder of the jar or pitcher with water. 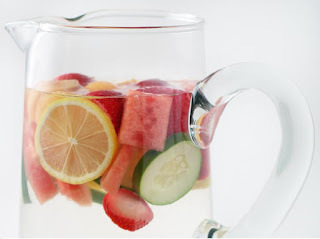 Allow the fruit and herbs to infuse the water for 3-4 hours before drinking if you are looking for more flavor. It is definitely subtle in flavor without the sweetness, you will be disappointed if you are expecting an explosion of flavor! Say goodbye to soda and juice, with these suggested refreshing, healthy flavors! The flavored waters should last up to 3 day, refrigerated. *HERBS: Use whatever herbs you like or happen to have on hand. Mint is the most obvious herb choice, basil, rosemary, sage, thyme, lavender, and tarragon. Shop Mrs. Fields Big Cookie Cake for the irresistible, classic recipe that is always a crowd pleaser! Click here! This looks quite delicious, Debby! And healthy ;) You should post pics of all of the presented flavours, I'm sure they are yummy!